Cities Made Millions Selling Taxi Medallions, Now Drivers Are Paying the Price Hundreds of San Francisco taxi drivers purchased medallions for $250,000 to drive in the city. Taxi incomes have plummeted after Uber and Lyft took over the streets, and drivers are saddled with debt. At a recent meeting of the San Francisco Municipal Transportation Agency, angry taxi drivers who want the city to buy back their medallions, surrounded Kate Toran, who heads the city's taxi program. Yana Kiziryan has two children. The youngest, Eddy, looks just like his cab-driving grandfather, Edward Agababian. Edward drove a taxi in San Francisco. He loved it and dreamed of owning a medallion. These little tin permits used to be awarded on seniority. But to try to balance its transportation budget after the 2008 financial crisis, San Francisco started selling the medallions for 250,000 dollars a pop. This was still a good deal. With a medallion, drivers could make between 5 and 7 grand a month. So Edward took out a loan and bought one. "He thought if anything ever happens to me," Yana says, "if I were to die, the family would be set. It was his insurance plan and his retirement plan." Taxi medallions used to be a great investment for cab drivers all over the U.S. Over a dozen cities sold these permits to operate cabs. Medallion values rose quickly, sometimes doubling in just a few years to hundreds of thousands or even over a million dollars, in the case of New York City. Then the ride-share companies, Lyft and Uber, came along. They operated without medallions or a cap on how many vehicles they could put on the road. The two companies used their venture capital to grow quickly and flood the streets with cars. Medallion prices plummeted. In New York City they fell from around $1.3 million to around $160,000. In Philadelphia they dropped from a high of $545,000 to $10,000. Similar devaluations struck in every other city with monetized medallions. Thousands of medallion holders each lost hundreds of thousands of dollars in equity. The supply of Ubers and Lyfts on the road also pushed down prices of rides and earnings for drivers of all kinds, whether they be in Ubers, Lyfts, or taxis. The pressure has taken its toll on workers in the industry. Amid the medallion meltdown, seven drivers in New York City alone have committed suicide. Edward's income plummeted along with everyone else's. His blood pressure began to go up. He started gaining weight. "[My dad] became increasingly restless and nervous," Yana says. "There were months were they didn't have quite enough to make all their bills." Sometimes she had to chip in to help out her parents. Yana said Edward even signed up to drive Uber and Lyft, just to try and get some extra rides. About two years ago, Yana and her whole family left for a short trip to the East Coast. Edward decided to stay home and drive. He went to the airport, like he did every day. There were so few fares at that point, drivers could sit for hours in their car waiting for a passenger. That's where Edward's friends found him. "His friends at the airport right away noticed something was wrong," Yana says. "They looked at him and he was green." Edward said he wanted to go home. "They were like, 'no'," Yana says. "'You're going to the hospital.'" 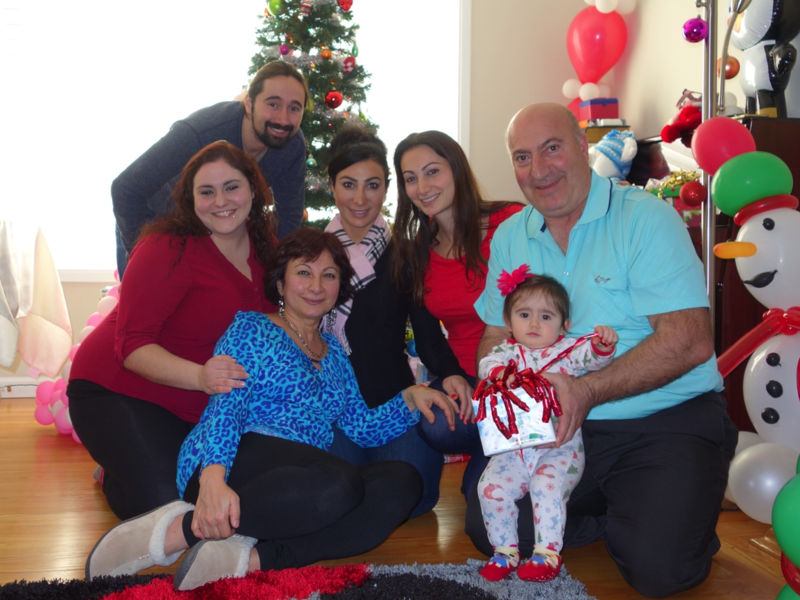 Edward Agababian (right) and his family. Agababian died at the age of 59 after driving a taxi for years in San Francisco. An ambulance came and rushed him to the hospital. Edward's aorta had torn. He was bleeding internally. Soon after getting to the hospital, he passed away. "The doctor told us that when he got to the hospital, they asked him if he wanted to call his family," Yana says, "and apparently he said, 'I don't want to make them nervous.' And so we didn't even get to say goodbye." Edward was just 59 years old when he died. The market for taxi medallions in San Francisco is now totally frozen. No one has bought or sold one in over two years. 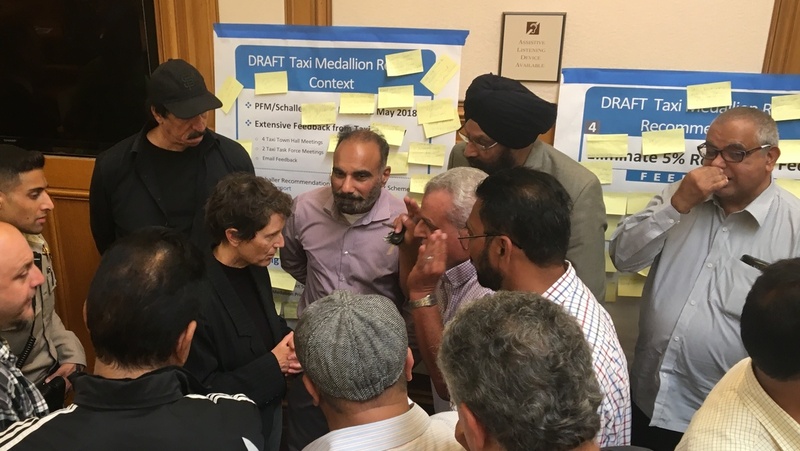 The city recently held a meeting with drivers to talk with them about potential changes to the taxi industry — things like allowing corporations to buy medallions, which the city hopes would encourage sales. Cab drivers who attended the meeting were supposed to stick up post-it notes with their comments on posters with the proposed reform. Almost all of the notes said the exact same thing: Please buy back our medallions. This is all that most drivers want. At the meeting, drivers like Inder Jitghotra and Magdi Yousef spoke about how the medallion was impacting their lives. Inder's family bought six medallions. "We are under water," he said, "Some family members are going to file for bankruptcy. We have no other option." "I already suffered two heart attack[s]," Yousef said, "I feel like I am dying. This medallion is killing me slowly." Around 700 drivers in San Francisco bought medallions, making the city about 63 million dollars. Over 150 drivers have defaulted on these now toxic assets. Kate Toran manages the taxi program for the city. "If I had a magic wand and could say this could all go away of course I would," she says, "Who wouldn't want do that?" The city is considering a few changes to thaw the medallion market, but unlike New York City, San Francisco has not put a cap on the number of Lyfts and Ubers. The city is also not talking about buying back the medallions, which Toran estimates would cost 160 million dollars. "That's not on the list of recommendations at this point," Toran says, "I think that's unlikely." After Edward's death, Yana Kiziryan's family was still plagued by their medallion. No one wanted to buy it from them. So they defaulted on the loan and took a massive hit on their credit. Even though it is too late for her father, Yana says she wants the city do something for the other drivers. Many are still out on the road just trying to break even on the little pieces of tin they invested their lives in.